The food was just OK. BUT, I am also a person that travels and sometimes my expectations can be higher than the “norm.” Service (once we did get our waitress) was great. The greeter was non existent during our reservation. The first server that made contact with us said nothing, as if we knew someone else would be serving us. The restaurant was empty the entire time. I had the crab cake Benedict, and I expected a fluffy crab cake. It was fried and with shredded potatoes. Not a fav of mine, however the calamari was decent. I didn’t like the stuffed mushrooms, they seem to be a bit over cooked. The popcorn shrimp were normal and regular popcorn shrimp, nothing fancy. The unlimited crab legs can only be eaten at the bar, so we skipped that. For the drive and the money, I’m not going back. I’m glad my food was a birthday gathering with friends. Otherwise I’d regret going. For two people, with apps, food and 1 martini and coffee, the bill was 97 dollars. Not my 97, but under 100. Walked in, told the hostess we had a reservation through open table. She said ahe couldnt check me in because they were locked oit of the system. Waitress was rude and barely spoke. Lobster bisque was horrible. Gritty and not 1 piece of lobster to be found. Salmon was partially burnt, baked potato was hard and king crab legs... Couldn't use the cracker because the shell so soft, meat was cold and hard. $85 for dinner, this was NOT what I expected. Had an 8:30 reservation. We were immediately greeted by a polite and genuinel courteous host. We were promptly seated and the rest of the evening provided us with prompt, attentative and courteous service. This place may not be considered envogue, highend, over the top as some newcomers to the business are trying to convey. Some of those places spend more on ambience and a fancy environment and lose the "basics" along the way. The ambience here is cozy, clean, not stuffy and inviting. This is a restaurant that does what many diners expect from an establishment. We generally do not want pretentious people who are just doing a job. 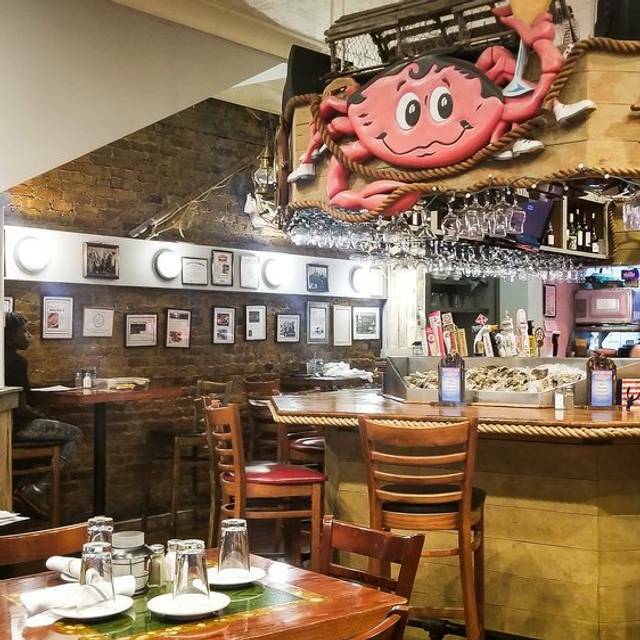 We customers can sense when servers go through the motions and then hurry to get you out of there Here at King Crab, the crew from bartender, host, and everyone who made eye contact with you greeted you with a smile as if you were a guest in their home. Our server was right on point. He made sure that his suggestions were aimed to help us decide and not move a product on the menu. We didnt feel hurried. He made it seem like it wasnt a bother to ask for small things, like more silverware, etc. We had the escargot,Stuffed hawaii fiish , shrimp scampi ( enough for two people). Our little guest had popcorn shrmp and a nice size hotdog. Oh and the oysters rockerfella. WOW! I have paid much more at other places and it takes a back seat to the ones at this place. I guess that is one of the reasons this place has been around for a looooong time in a city where many other places come and go. It still knows what many of us diners really care about and what totally matters when we dine. FOOD, SERVICE and PRICE are exceptional here. The attention is placed where it should be- on the customer. Great customer service and genuinely cared, food was so good! Recently visited King Crab with a group of ladies and our dining experience was fabulous. We had many appetizers and they were all delicious. The stuff mushrooms were totally awesome and the lobster bisque was mind blowing delicious. The calamari and buffalo wings were great too. Oh and so was the gumbo soup. Lol. I guess that surmise that all of the appetizers we ordered were great. The snow crab legs had to be the freshest I've ever tasted. The only thing that I didn't care for was the drawn butter. I guess it was a smoky taste that it had but it kind of took away from the delicious crab legs. I would have preferred either garlic and lemon seasoned butter or just plain. Overall good experience. Waitress was very friendly and helpful (so was manager). Only disappointment this time was with food: mussels were very small and quite a few of my shells were empty, lobster bisque was watery, lobster must have been puréed, and flavor had a pumpkin-spice hint; returned for replacement of clam chowder. It was also watery; with limited clam presence). Salad was good, and crab legs were also tasty. The freshness of the seafood was good especially me being from The Gulf Coast where we eat fresh caught out the water. The food was phenomenal and fairly priced in my opinion! The service was excellent - especially for a party of 15+! I am already looking for reason/opportunity to visit again. This was a great seafood restaurant. It is a fixture on Halsted avenue. Always a good choice after going to the theater at the steppenwolf. Great choices, good drinks, excellent service with a personal touch! Will definitely be back. We notified our sever that we had theater tickets but we were told they were training a new chef to explain the very slow service. We used to go to a local crab place for years and King Crab House wasn't even on the radar. Once the owner of that other establishment passed, we ventured out and found this hidden gem. From the outside it is unassuming, however, the food and service is out of this world. Can go up against any king crab downtown. It was an immediate family. The owner, Cy, the manager, Mitra and the fabulous staff (ask for Mary, she's a terrific server) make a really magnificent experience and that's why we come here many times a week and bring friends to enjoy the service and food. Wonderful night. Food was excellent, our waitress was outstanding, and everyone had a good time. It took almost 15 minutes to get a drink order put in with our waitress. She then forgot to place my appetizer order. Crab legs were tiny. Not worth the money or the time spent waiting on everything. Good menu selections. We had crab cakes and shrimp scampi. All delish! Our waitress was so nice and gave us lots of time for our wine and leisurely dinner. Thank you. My partner and I drove over an hour to eat here because we saw it says "all you can eat crab Saturdays, Lunch only" on their website. We arrived at 1pm only to have our server tell us they no longer do the all you can eat promotion. She then proceeded to convince us that the all you can eat is not a good value because you only get a half pound of crab at a time. So, we decided to stay and ordered ourselves 1lb each of the king crab because it says its one of their specials on the menu. Not only was the 1lb of crab completely NOT worth the $40 we spent on it, but we definitely would have gotten more for our money if they still did the all you can eat which was only 10 dollars more than the single pound. Also the crab itself was not quality - really the only way to eat it is to douse it in melted butter. Overall we are very disappointed with our experience here and do not think its right that they use the "all you can eat" promotion on their website as a way to lure customers in. Overall, we definitely would not recommend to others. We would have probably been more pleased going to a Red Lobster. Very disappointing. 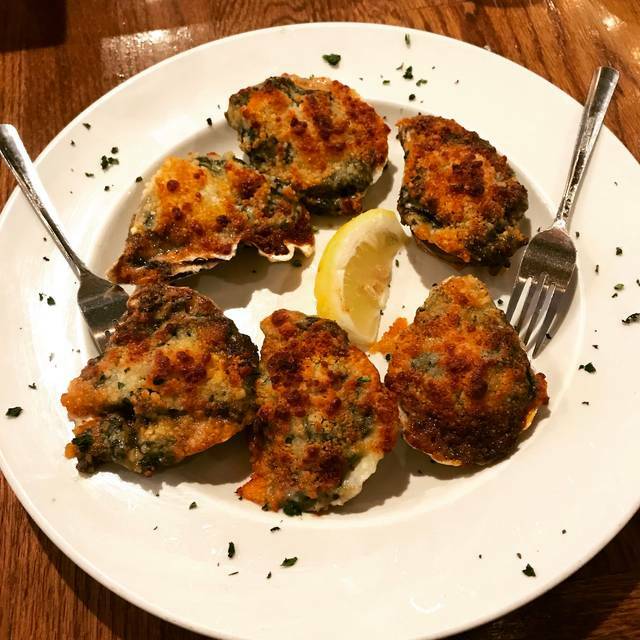 There were three of us and two of the appetizers – clam chowder and a salad – came out well before my oysters Rockefeller. Like 15 minutes before. Inexcusable because they could’ve held those two appetizers for the hot oyster dish. I had only started digging into my oysters when they brought the entrées. We asked that they be held in the kitchen until my appetizer was finished. That happened and when they brought the dishes back out my entrée was cold. I had also ordered it with sage butter on it and they forgot to put the butter on. One of my friends or ordered the lobster roll and it was a large piece of bread and two very small teaspoons full of lobster. The manager came over several times and offered to take off the oysters, then give us a round of drinks which we didn’t want, and then he reduced our bill by 50%. I was so disappointed as the other reviews I had read said this was a good restaurantI appreciated that the manager was attentive but I would’ve preferred that we would’ve had what we had ordered when we ordered it. Just average. No zest. Quality OK. Spend a bit more and go to Joe’s. We did not have a very good experience on our visit to this restaurant. Although the food was good, the dining room was cold, had to listen to rap music, and the service was slow. 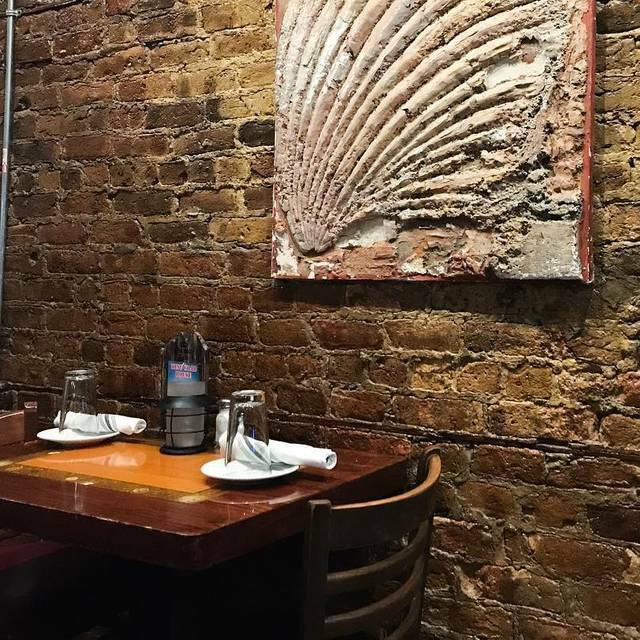 If you love crab, or just love seafood, this is a must go to when you're in Chicago. Love the front seating area by the windows & the bar. Great price roll back specials! Highly disappointed when the website says they have all you can eat crab legs every Saturday and Sunday for lunch and this is untrue. My husband and I booked a reservation for noon on Saturday just to be told that they do not have that anymore. I even showed them their website that says they do. I never would have gone to this restaurnt had I known they would not have this special... as there are many good seafood places much closer to where we were staying. The waitress was kind and understanding and the food was decent but just not what I had gone anticipating. A very frustrating experience. We were offered desert for our troubles which we declined. Overall, positive experience. The food was absolutely great! Kudos to the chef!! Nice atmosphere; waitress was wonderful. Only very minor issue was that restaurant was running published promotion (menus also reflected prices for promotion). At end of dining, our bill reflected different cost. When asked, we were told that because the promotion was priced too low, they increased amount. Technically no problem with cost, just not a good way in way presented (after the fact on bill). Having someone mention the change on front end would have been more professionally received. Our server was very attentive! The food was awesome. Will definitely be back. Food was great. We really enjoyed our time. We came here to celebrate my daughters 22nd birthday. So we ordered wings and chicken quesadillas. The portions were very small for the price, 4 quesadillas so that was 2 flour tortillas cut in half for $10 and 6 wings for $10. There was a King Crab Special on Monday 26.99 which in usually 40 each. My 18 year old son and my daughter ordered 2 orders of the crab legs. Food comes out crab legs look good, salmon, scallops did as well, but the ribs were not in a full alab as presented on the menu, they were split. They brought out some garlic butter for the crab legs and my salmon. My children tried their crab legs and they were very disappointed with the taste. They tough and rubbery and some of the baked potatoes weren't cooked all the way, they were hard. My dad and husband tasted the ribs they were bland and the sauce had a terrible flavor. As they tasted them they knew the ribs weren't fresh as if they had been reheated. My salmon was fresh. My daughter and son were upset because their food didn't taste good. My mother tells the waitress that my daughter wasn't happy with her food and my daughter told her how the crab legs tasted. The waitress says, " oh let me show you how to crack them". This made my mother upset and she told the waitress that she doesn't need to show her how to crack them and that she was insulting my daughter by saying this to her. My daughter told her she was talking about how they taste and she needed order something else. So the waitress was not happy at this point, you could see it on her face. She took both of their plates away and came back with the menu and said " you shouldn't order the crab legs, since that's how they come". Of course then my mother gets upset even more and tells the waitress about her demeanor and the waitress points her finger at my mother and says "I'm not serving you" My mother was highly offended by the finger pointing and the gestur, this set her off. At this point the dinner is ruined and birthday too! My family and I were here last night for dinner and everything was excellent. Everyone was satisfied with their meals for the most part,however, while the salmon was cooked very well, they put it on the plate skin side down therefore the skin was very soggy and inedible. Other than that, I will be back most likely sooner than later but this time for the King Crab legs! Our waitress was wonderful and there was also another older gentleman who was just as delightful. The host was great but our server wasn’t. She basically disappeared for most of the night. Also, the food is decent but a little bland. I went with a friend for their “38 year roll back pricing Special. I ordered the “King Crab legs” off of the Special menu and I noticed that the crab legs I received was not the same size nor portion size as the ones ordered by the other patrons off the regular menu. I asked my server and she explained to me that the Special King crab legs were different crab legs than the ones from the regular menu. I was under the impression that the reason for the “roll back pricing” was to offer the regular King crab legs at the “roll back” price but the same size crab legs and portion size as off he regular menu. My friend and I were very disappointed that the Special did not inform us that the crab legs were not the same ones from the regular menu. Had I known I would have not ordered from the Special menu so that I would have had the full experience of their King crab legs. Other than that the drinks were good, service was awesome, and ambiance was nice and quaint. They have about 4 different menus and hide the discounted ones until you ask for it. Food was mediocre. Lovely , very friendly service with excellent food . Generous portions and many specials . A great place to go before the theatre or any other time . Best seafood around . Will definitely go there again . Try to get there during the anniversary celebration (early February, 2019). Rollback prices on food and drinks make for a VERY good value. Dinner took nearly three hours. We made a reservation and noted the main dining room, got sat in the bar area and were asked if we'd like to sit at the bar. Server was flustered and clearly working two different sections that are not close to each other and our part of her section was an afterthought. She brought us our bill and overcharged us on every item. King crab is presently having an anniversary event where everything is half off. She chided us and told us that we should have told her and ordered off the right menu. We pointed to the menu and told her we did order off that menu and had even pointed to it as we were ordering. She said "oh yeah, i'll get it fixed I guess" and took about 15 minutes to get it fixed. We saw a couple leave without ordering because of the bad service. She came back with the adjusted bill and it was still wrong. We just wanted to get out of there at that point so we just left. Going back and forth with her was not worth it. Price rollback special menu is amazing! Terrific value and excellent menu options. Thank you!